Those of you who just started reading may not know that my husband and I lived in North Dakota for several years while were in college. We lived in a small college town (granted it was a large town for North Dakota) called Grand Forks. The town is unique in that it is half in North Dakota and half in Minnesota. It’s about an hour out of Winnipeg (AKA Canada). Brrr.. When I first arrived it was a major shock to me. I knew Grand Forks was a small town, but it was different from seeing it was a small town. I remember being on the highway, on the way in, and my husband saying to me were just about there; and and being horrified because I couldn’t even see the town from the highway. None of the buildings were tall enough! But despite being small, a lot about the place grew on me. The summers are hot, but lovely. The sun lasts well until nine. It gives you that magical endless summer feeling. I found my favorite bar/restaurant where a very good friend and I would spend hours chatting over dinner and glasses of wine (the Toasted Frog). I also found Dakota Harvest Bakers. The makers of the magical Raspberry Walnut Scone. Oh what magnificent sones! Buttery, subtly sweet. A hint of raspberry, walnuts. Oh my goodness I could eat a million of them! I’ve been wanting to recreate their recipe forever. 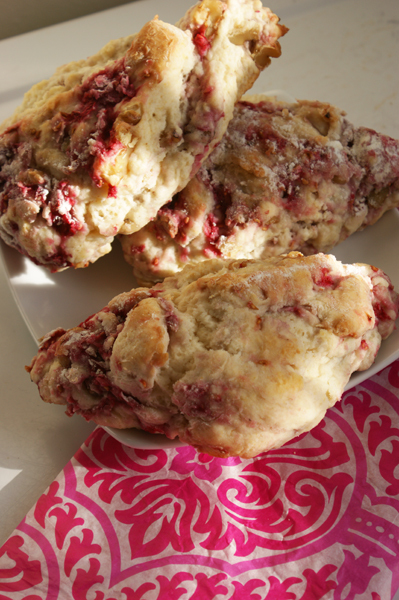 We’ve been home in Colorado for five years or so and I haven’t had one of these scones since. Honestly I can’t 100% remember what the scones taste like. But I’m pretty sure today’s recipe isn’t a replica. 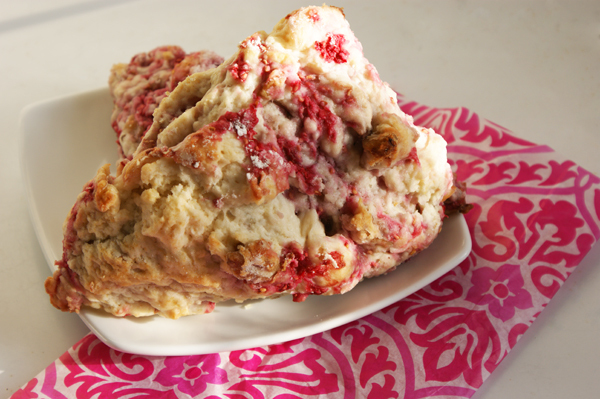 However it is in fact still a delish raspberry walnut scone! It too is buttery and wonderful! 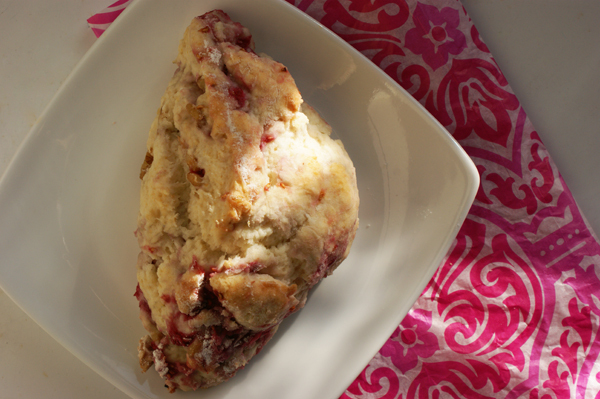 I think the difference to the best of my memory is that this scone has fresh raspberries and I’m suspecting Dakota Harvest’s had preserves of some sort? Anyhow, my recipe today packs a serious raspberry punch! (In addition to being buttery and full of walnut wonderfulness.) Plus it’s kinda pink. Actually I should have totally made these for Valentines Day guys! But you can still make them today to share with your Valentine! 1. Preheat oven to 350*. In the bowl of a large stand mixer add flour, sugar, baking powder, butter, and milk. Mix on the low setting to combine. You may wish to pause and use a rubber spatula to scrape the sides of the bowl at least once to ensure everything mixes well. 2. Add in the raspberries and walnuts and very gently fold then into the dough by hand or with the spatula. The dough will be sticky so lightly flour your hands first if using that method. Some of the raspberries may burst while mixing them in, this is ok.
3. Turn the dough out onto a well floured surface and shape into a long flattened rectangle. Using a sharp knife and cutting on the diagonal cut 8 triangles. 4. Place the triangles on a baking sheet, spaced at least 2 inches apart, the scones will rise and puff quite a bit during baking. 5. Bake for 20 minutes or until the sones are lightly browned on top. Allow to cool for ten minutes before removing from the baking sheet. These look a-MAY-zing! I don’t normally do nuts in baked goods, but I think I’d make an exception – at least once – for these. Thank you! I think they came out pretty good, they ended up getting eaten pretty fast at my house. Let me know what you think when you try them!